Despite promises that community engagement activities will enable policy makers to identify complex and contested community attitudes, and that these will be included as part of the policy making process, a closer look at Australia’s engagement activities reveals something quite different. Our analysis reveals the extent to which industry interests have captured policy makers and regulators, dissenting voices have been excluded from engagement processes, and engagement processes have not connected with actual policy making activities. Reflecting on these limits, this paper concludes with recommendations for improving public engagement processes related to nanotechnologies in Australia. The remarkable campaign highlights an apparent rupture between the discourses and practices of deliberative governance and adversarial power politics. The orthodox processes of consensus politics were rejected as inadequate by conservationists in favour of a strategic blend of community mobilisation, electoral politics and protest. Case study (2004) by James Whelan and Kristen Lyons. James Whelan (2012) describes how parts of the environment and climate change movements are adopting the techniques and logic of community organising. This challenges them to learn new habits of political analysis and engagement, and unlearn old ones. James Whelan & Kristen Lyons. 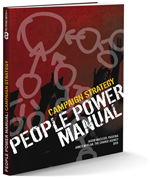 Examines a hugely successful campaign run collaboratively by several ENGOs. James Whelan (1994). A critical assessment of Friere, Knowles and community development.